A Rocky Road for Small-Caps? 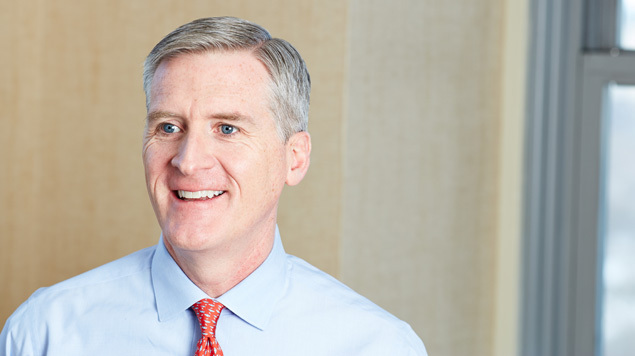 Co-CIO Francis Gannon on why a rockier road for small-caps could help select cyclicals to accelerate. Global equity prices began to fall in dramatic fashion last week as a wave of volatility hit stocks. As of right now, this looks more like what could ultimately be a correction in the 10-12% range (though we also wouldn’t rule out a mostly restorative rally in the coming weeks). Considering the rate of economic growth and the primarily healthy state of corporate profits, it does not look like nascent phase of a bear market. Since the Russell 2000 Index reached its most recent, and record, high on 8/31/18, the small-cap index has declined 8.1% through 10/16/18. While plunging share prices and high volatility are seldom a welcome presence, their more or less regular recurrence is part of the historical norm of market performance, which is largely why we’ve been calling for increased volatility for a while now. We not only accept this reality, we do so in a constructive spirit, trying to use these dislocations to take advantage of potentially rewarding long-term opportunities. Prior to this recent downturn, most stocks had experienced a smooth-running upswing from roughly February 2016 through August of this year that was as historically anomalous as it was enjoyable. Based on small-cap’s long-term performance and volatility patterns, we’re surprised that it lasted as long as it did. After all, we’ve seen major shifts in the post-Financial Crisis environment since 2016, the most important of which are the much faster pace of U.S. economic growth and the reversal of direction in interest rates (to which we would append the frequency of increase as well). Yet one element that hasn’t yet changed in the decade following the Crisis is small-cap market leadership, which has been dominated by growth and passive approaches other than in 2016 when small-cap value led by a sizable margin, as did active small-cap approaches. We think that’s beginning to shift. We have described ourselves recently as “selectively bullish but highly wary.” The most stretched valuations within small-cap, as well as the least attractive earnings profiles, have chiefly been in growth stocks and defensive industries. 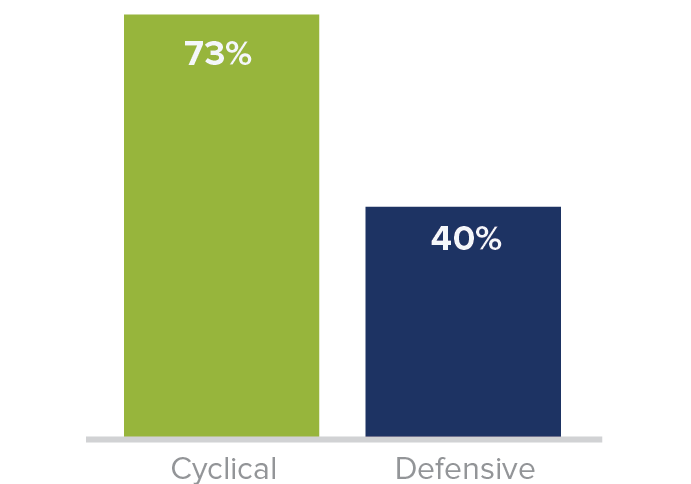 Many of the cyclical stocks that we hold, on the other hand, boast strong earnings and/or profitability, robust fundamentals, and guardedly optimistic outlooks. We think these qualities are more likely to be rewarded as interest rates continue to rise, multiples are pressured, volatility increases, and overall equity returns come back to earth. This may sound like something of a grim or at least muted forecast, but we see it as a distinct positive for active management—particularly for approaches that focus on valuation and risk management. The Russell 2000 consists of many companies with significant leverage and/or no earnings. As of 9/30/18, more than 35% of the companies in the Russell 2000 were non-earners while the long-term debt to capital within the index climbed from 29% at 12/31/07 to 34% as of 9/30/18. These metrics, as we’ve argued before, present very real risks for the index. But not, from our perspective, for all small-cap stocks. From our perspective as small-cap specialists, those small-cap businesses that execute best, especially with regard to earnings growth, stand poised to benefit most in the uncertain days that lie ahead. On the more challenging road that we see ahead, one marked by lower returns, higher volatility, and rising rates, select small-cap companies with low debt, solid earnings, and relatively more attractive valuations—most of them in cyclical industries—look poised for leadership. Although some of these companies began to make stronger moves in the third quarter, the sizable valuation gap still exists between many small-cap cyclicals and the rest of the market. 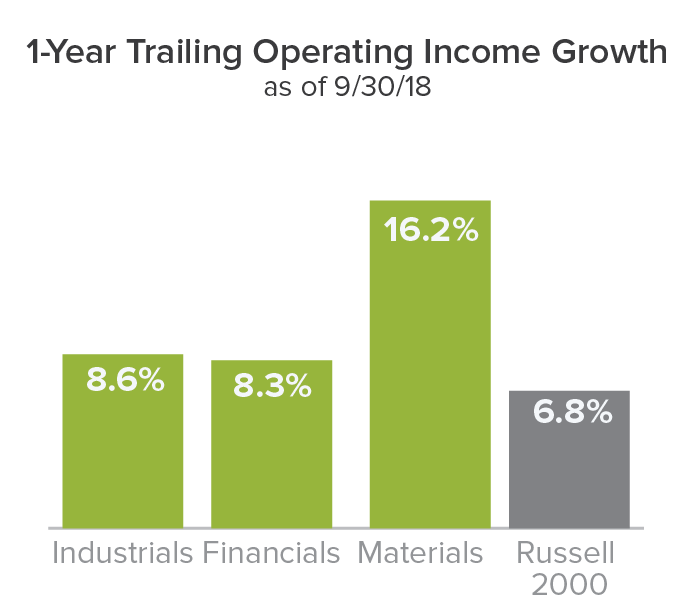 We recently looked at one-year trailing operating income growth—a key metric of fundamental strength—for two important cyclical sectors—Industrials and Materials, which shows faster growth than the Russell 2000. 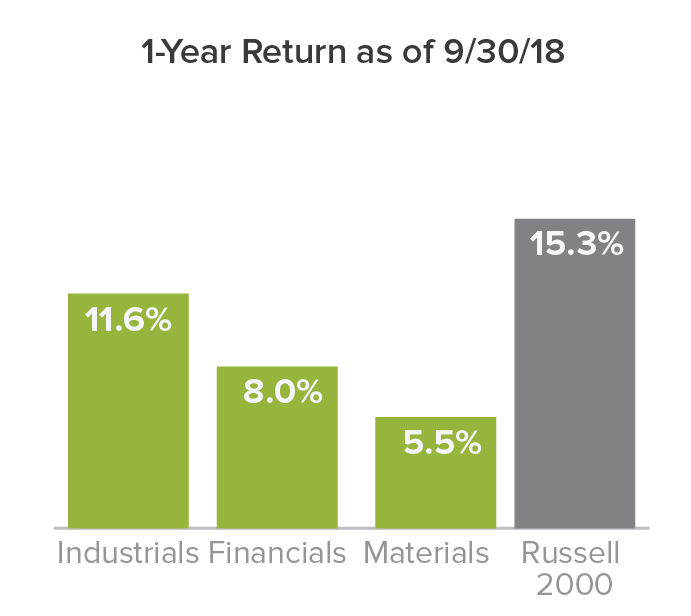 And the interplay between these numbers and one-year returns through 9/30/18 indicates that investors are missing out on opportunities to capture the benefits of earnings growth.